It’s a new year, full of new possibilities! 2012 resulted in a lot of growth for me personally, professionally and for the Super Woman Brand. Change is good, but it isn’t always easy. I’m finally at a place where I can actually see things coming together. And it’s a beautiful sight to behold. If nothing else, I’ve learned a lot about patience and the rewards that come about from being more patient. In 2012 I had to make a lot of hard decisions also. More proof that change isn’t always easy. Letting go and letting God work in your life can be very challenging. I stepped deeper into my faith and learned how to walk in it more as well. I don’t let people deter me or determine me with their own personal agendas. And many people have tried…and failed. In 2012 I had to cut a lot of people from my life. Well, honestly it wasn’t always me. Most of the time it was God weeding my garden and taking out the trash when He was done. Everyone isn’t meant to reap the benefits of my work, my creativity or the life that the Master’s Plan is resulting in. God made sure they left and that they are not missed. Some people who were cut off before 2012 tried to come back in 2012. They learned that they were no longer welcome in my Super World. I ended 2012 on a very high note. And this is just the beginning! 2013 has so much to offer. 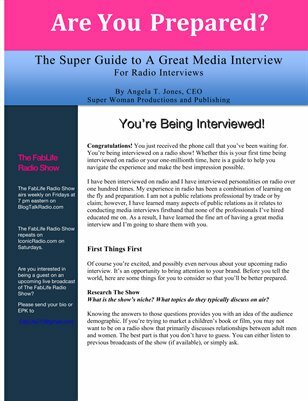 The FabLife Radio Show is doing very well and will improve tremendously going into the new year. We have new guests scheduled and returning guests who enjoyed being on the show from 2012. I’m preparing to fully launch FabLife Apparel and Accessories in 2013. The Official Super Woman YouTube Channel will be home of new digital video content. I suggest that you subscribe so that you’ll receive information as its posted online. I’m increasing my workforce to allow young people to gain experience in their fields of study. It has taken almost a year to find the best of the best, but it has been well worth it. Many additional opportunities have presented themselves in my career for 2013 and are in negotiations. As all of my plans become finalized Super Fans will be the first to know. Some of my new opportunities are a result of my 2012 goals that were set and worked on by my Super Manager and I. So they didn’t just fall out of the sky like Kryptonite and they aren’t just because I’m cute. They were a part of a plan. Proof that proper planning produces prosperity. As I begin my 2013 with a very long list of goals to accomplish and many already near completion, I hope that you will also set goals for yourself. When setting your goals, make sure that you are patient with yourself and the processes. Everything doesn’t happen overnight or by magic for everyone. People who have it the easiest often don’t last long and lack true substance. That is true for everything from weight loss to increasing your earning potential. In anything you do, you want to strive for longevity. Longevity takes planning, productivity, prayer and patience. Those are just a few of the requirements, not all of them. Happy New Prosperous Year, Super Fans! Let’s make 2013 Fabulous! Fast forward to December 2011. I said to God “This minute of pain has been a whole year.” God then told me that His time is not my time. I’m very glad that time flies. I knew in 2010 I would face difficulties in preparation for prosperity. I just didn’t know it would last for the whole year. I went into the year making necessary changes to my life, my lifestyle, my mindset and I stayed positive. At each turn, there were difficulties in my life that many other people never even saw. In my growth I’ve become knowledgeable that in order to build something up, you first have to tear it down ~ that’s if you want it to be built right. You can’t constantly build on top of foundations that are not solid or structures that are not sound and expect to have success. In our pursuits, we often for that. We want everything to be easy and painless. We want everything to be pretty and perfect. We want our plans to be without flaws and our successes to be without any trials. That is not the reality of my life. I’m sure some of you also know what I mean. This year has been the worst for me financially. Literally. I have over $92,000 in debt. I have no real assets to speak of and very few tangible items that I own free and clear at this point. I’m not exaggerating. This year has been that difficult for me. The only thing I own of any real value is The Brand and my creativity. Apparently, that’s all I needed to have this year. But there’s already a plan in place to change all of that in 2012 and to add financial stability to my newly rebuilt foundation. God knows that in order for me to truly appreciate what He has for me, He had to take some things away from me. He also made adjustments in my life to make room for something better. Every friend I lost was replaced by a better friend. Ever opportunity I was unable to take advantage of is being replaced by bigger and better opportunities. Every person who decided I wasn’t worth their time or acknowledgement was replaced by people in positions to help me achieve my goals. The worst year financially, was one of the best businesswise. The year 2011 gave Super Woman recognition. People know who I am. Not thousands of people, but enough. It’s a really wonderful feeling when someone from New York or Atlanta says to me “I’ve heard of you” or “I’ve heard of The Goodie Bag“. It’s nice when the editor of a major publication asks why I didn’t submit my biography for their publication because I’m “doing amazing things”, and I can say it’s because I had more amazing things that I wanted to add to my biography first. I’ll be in that publication in 2012. So what if I didn’t make a lot of money in 2011. I did make a mark. That feels good. The Super Team is also under construction for 2012. God is bringing people into my life that I can collaborate with outside of my current environment. He’s also blessing the people already on the Super Team in a way that I don’t even think they realize yet. I truly thank God that I’m in the company of very talented and ambitious people who are good at what they do. They inspire me to do what I do even better. It’s hard on me sometimes, having this extremely high level of ambition, but I observe the ones who came before me. I learn from their mistakes and successes. I consult with those who know the industry and I absorb their wisdom. I look for different and efficient ways of doing things that have been done before. And I try to find ways of doing what has never been done before. Why is it taking me so long to get to where I’m going? Because it’s a journey, a process and an experience worthy of hard work and dedication. I’m striving for longevity, not popularity. I thank God for my tests, my challenges, my tragedies, my hurdles, my mountains and the tools He bestowed upon me to handle them all and evolve even more into the fabulous woman He has created me to be. He gave me many gifts. Some will get me into the room. Some will keep me there. Some will allow me the ability to build new rooms. I know WE’RE nowhere near done. This is just one step of many I have yet to take. I’m ready for what’s next. I welcome the New Year and a new day. To my Super Team, we will all be driving Bentleys one day soon. To my Super Fans, I appreciate your support and encouragement throughout this past year. I will always give you something fabulous to look forward to, be entertained by and educated through. You will not be disappointed by what comes from The Brand.